Over the last decade, the ‘traditional’ drug scene has been supplemented – but not replaced – by the emergence of a range of novel psychoactive substances (NPS), which are either newly created or existing drugs, including medications, now being used in novel ways. By the end of 2014, in excess of 500 NPS had been reported by a large number of countries in the world. 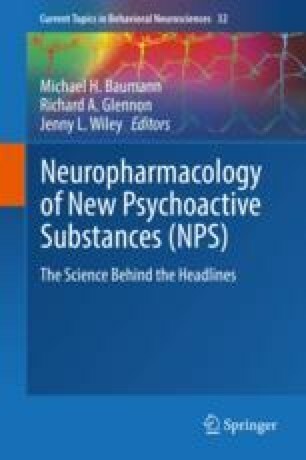 Most recent data show, however, that synthetic cathinones, synthetic cannabinoids, and psychedelics/phenethylamines account for the largest number of NPS. The present chapter aims at providing an overview of the clinical and pharmacological issues relating to these most popular NPS categories. Given the vast range of medical and psychopathological issues associated with the molecules here described, it is crucial for health professionals to be aware of the effects and toxicity of NPS. A general overview of the acute management of NPS adverse events is provided as well, although further studies are required to identify a range of evidence-based, index molecule-focused, treatment strategies. The rapid pace of change in the NPS online market constitutes a major challenge to the provision of current and reliable scientific knowledge on these substances. This paper was supported in part by grants of the European Commission (Drug Prevention and Information Programme 2014-16, contract no. JUST/2013/DPIP/AG/4823, EU-MADNESS project). Further financial support was provided by the EU Commission-targeted call on cross border law enforcement cooperation in the field of drug trafficking – DG Justice/DG Migrations and Home Affairs (JUST/2013/ISEC/DRUGS/AG/6429) Project EPS/NPS (Enhancing Police Skills concerning Novel Psychoactive Substances; NPS).